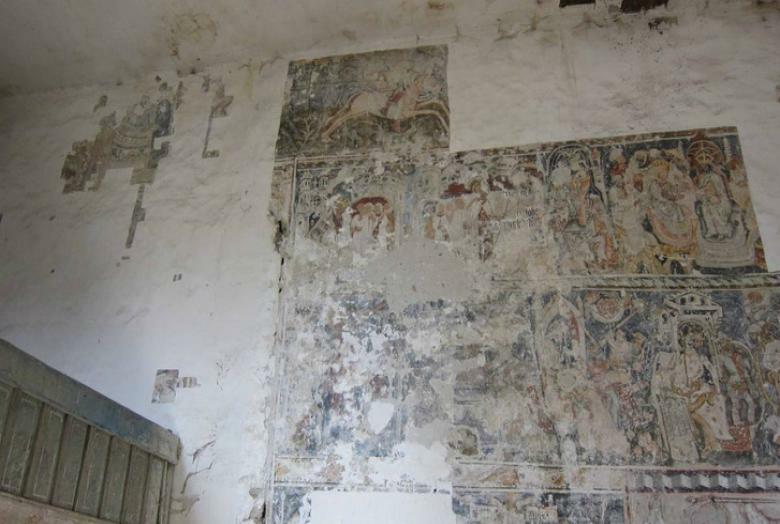 News of a spectacular discovery in Transylvania was reported by Hungarian media yesterday: a previously unknown cycle depicting the legend of St. Ladislas was partially uncovered in the church of Somogyom in Transylvania (Șmig, Romania, germ. : Schmiegen). The village of Somogyom (Schmiegen) was a Transylvanian Saxon community, near the town of Medgyes (Mediasch/Mediaș), established probably in the 13th century - although it was first mentioned only in 1317. Its parish church was built in the 14th century, and was rebuilt during the 15th century. The winged altarpiece of the church was painted some time between 1510-1520 (it is now on permanent loan in the National Museum of Art of Romania, in Bucharest, click on Room 3 in this panorama). Like all of the Saxon communities in the area, Somogyom became Lutheran during the first half of the 16th century, and over the following centuries, the original medieval decoration of the church was slowly covered over. We know that the church was rebuilt and redecorated in 1859, and again in 1909, when a new altarpiece was erected in place of the medieval one. 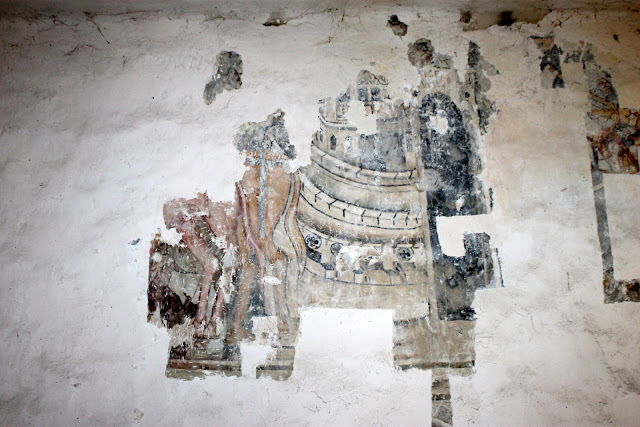 By this time, the medieval frescoes of the church were long forgotten. 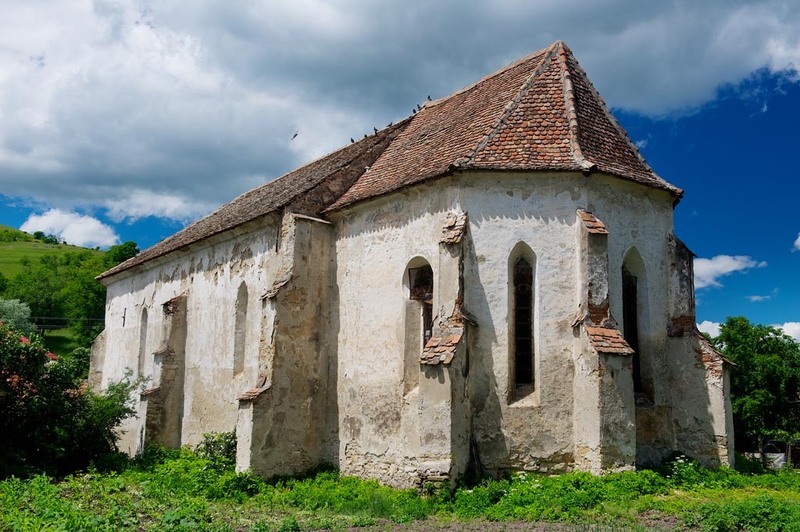 As both the Hungarian and Romanian population of the village increased, the Saxons slowly diminished, and the Lutheran church has been out of use for decades now. It is thus one of dozens of important medieval churches in Transylvania where urgent actions of protection would be necessary. 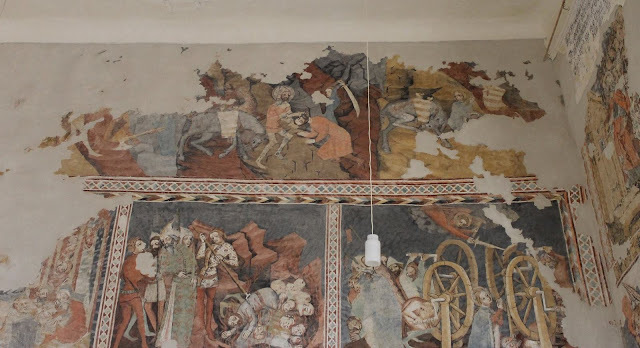 I've reported on this endangered heritage several times - for example when a medieval copy of Giotto's Navicella was discovered in the ruinous church of Kiszsolna (Senndorf, Jelna) or when two church towers collapsed after last year's winter. Somogyom, scenes from the Legend of St. Catherine (2 rows), the Crucifixion of St. Peter, etc. At Somogyom, restorer Loránd Kiss and his colleagues have carried out surveys and smaller interventions of preventive conservation during the last few years, in an effort to save the building. 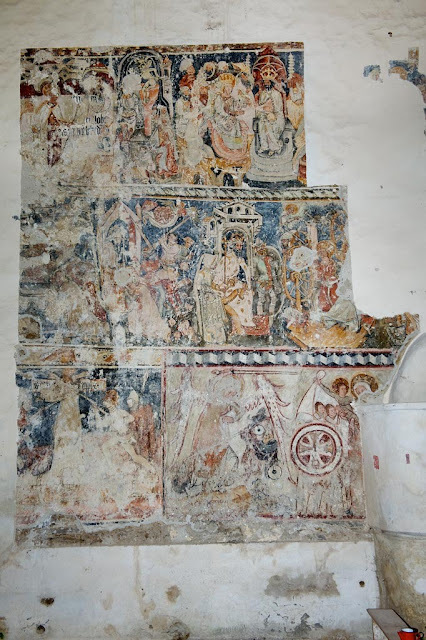 Examination of wall paintings were carried out in the course of a general survey of Transylvanian Saxon churches, and attention was focused on Somogyom after a few scenes were accidentally found there during repairs. 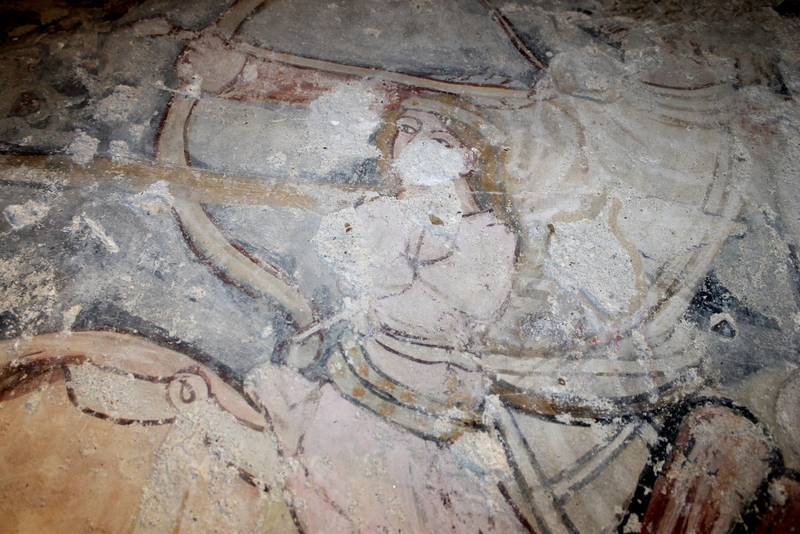 Loránd Kiss partially uncovered the medieval frescoes in the nave of the church a few years ago, revealing a high-quality cycle of the Legend of St. Catherine of Alexandria (these were published in 2013). It was established that the entire north wall of the church, as well as the entire sanctuary was once fully painted - meaning an estimated painted area of about 250 square meters. 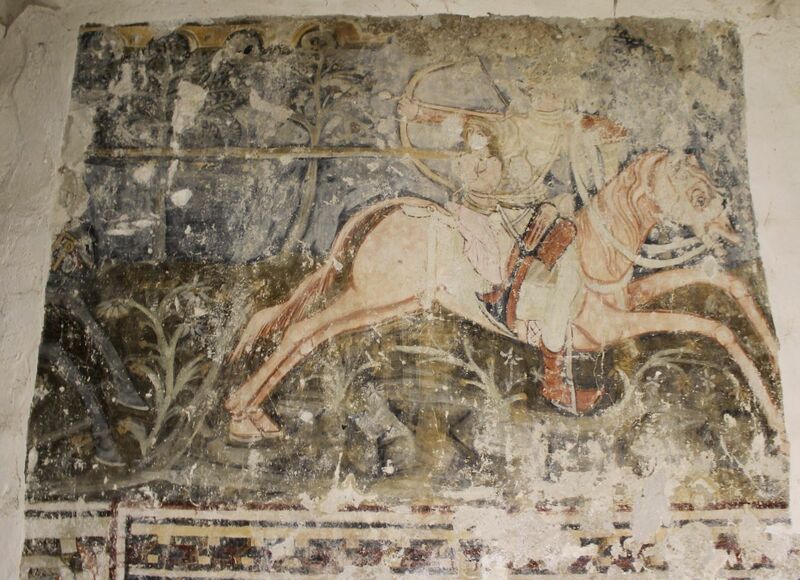 Research continued this October, when wall paintings in the top register of the north wall of the nave were surveyed. 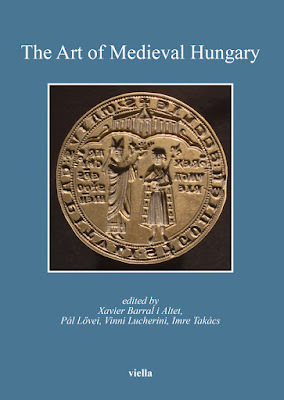 As Loránd Kiss reports, here the Legend of St. Ladislas was uncovered. So far, only parts of a largely intact cycle were freed, as seen on the photos below - with the scene of Ladislas chasing the Cuman being the most clearly visible. The wall paintings can be dated to the beginning of the 15th century, a high point in the popularity of the Ladislas cycle. The painted cycle of the Legend of Saint Ladislas (ruled 1077-1095, canonized in 1192) was one of the most popular stories in medieval Hungary, and can be found in dozens of churches in the former territory of the medieval Kingdom of Hungary, from Croatia to Slovakia as well as in Romania (in Transylvania). Two new websites help give an overview of this topic and these monuments. 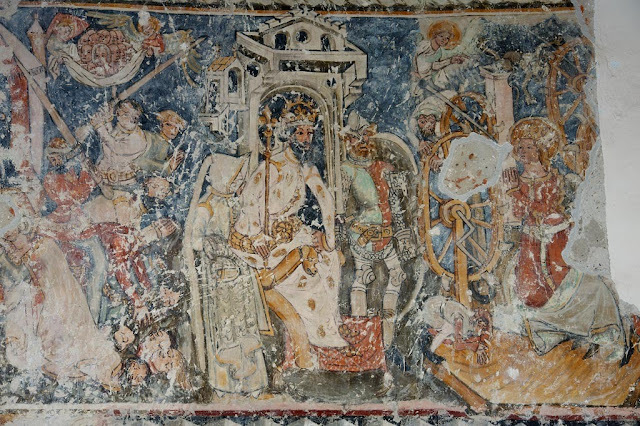 The official legends of St. Ladislas do not include a popular episode, which was painted in many churches of the medieval Hungarian Kingdom, depicting prince Ladislas in the battle of Kerlés fought against the Cumans in 1068. During the battle, Ladislas rescued a Hungarian girl abducted by the Cumans. The usual sequence of scenes is the following: upon hearing of the invading Cumans, prince Ladislas and the Hungarian army leaves the castle (generally identified as Várad); then a tumultuous battle against the Cumans ensues. Ladislas then noticed a Cuman warrior, who had abducted a Hungarian girl, and proceeds to chase him on horseback. The Cuman is shooting shooting arrows back at Ladislas, who is pursuing him with his lance in hand – but cannot reach him. In the climax of the narrative, the heroes dismount, and a duel with bare hands follows: they pull at each other’s belt and grab each other’s shoulders, to no avail, until the rescued girl intervenes and cuts the Cuman’s tendon with an axe or sword. The king and the girl then decapitate the Cuman; and finally Saint Ladislas rests under a tree with his head on the girl’s lap, as she touches the king’s hair. The textual counterparts of this narrative are known from fourteenth century chronicles, such as the Illuminated Chronicle. During the last two decades, the discovery of several new cycles of the legend in Transylvania has greatly added to our knowledge of these paintings. 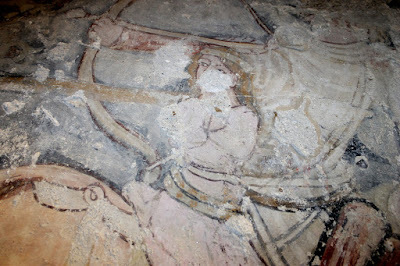 Recent discoveries inform us that the cycle was once present in the churches of Transylvanian Saxons as well: a fragmentary cycle is known at Ecel (Ațel / Hetzeldorf), while a monumental (but fragmentary) cycle, painted at the beginning of the 15th century was uncovered and restored two years ago at Szászivánfalva (Ighișul Nou / Sächsisch-Eibesdorf, see above). The cycle at Somogyom appears to be just as important - it is hoped that it will be fully uncovered and restored in the near future. Currently, a conservation plan is being written, which is needed for the work to continue. It is hoped that the funds needed for saving and restoring this important fresco cycle will be available. I thank Loránd Kiss for providing photographs for this report. This site is so interesting...just found it ! !